Honestly embarrassing. I'm setting up for my live shot outside the arena, just watching fan after fan exit early. Now I'm watching horrible, drunk, quitting fans desperately trying to get back in. This is madness. @juanguibeme they're not. It's absurd. People screaming about how they paid good money. Really?! Cops finally here. Fans still pounding on the doors begging to be let in. I was born and raised in Miami. I used to hate the national perspective against Heat fans but I can't fight it anymore. So my stereotype of Heat fans are true. Not all Heat fans are like this, but it’s for sure these bandwagon fans give a bad name to the real basketball fans. Maybe it’s the culture I’ve grown up in, but in the Bay Area, we appreciate the team no matter what. The Oakland A’s fans and Golden State Warriors fans gave the team a standing ovation when they were eliminated from the playoffs. That’s the sign of respect for the team. But I guess in Miami, beating traffic is more important than thanking and believing in your team. I hope the Spurs win Game 7. I know these Heat fans don’t deserve to have a repeat champion. I mean, I’ve never seen a group of people jump off and jump back on a bandwagon in such a quick time. 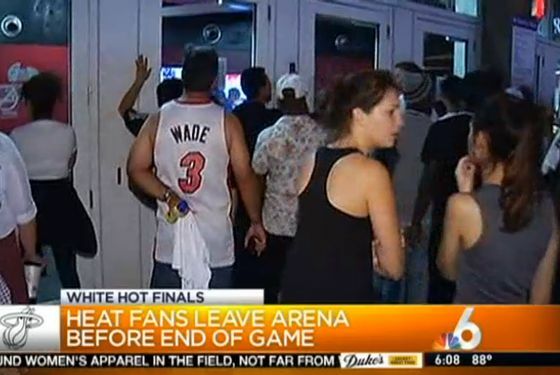 I'm sad at the #FakeAzzHeatFans that was walking out the arena before the game ended. Those are the #bandwagon fans y'all was talking about. I am glad they enforced the rules and did not allow them to return inside. This entry was posted in Miami Heat, NBA, Playoffs, Sacramento Kings and tagged Bandwagon, Fans, NBA Finals 2013. Bookmark the permalink.